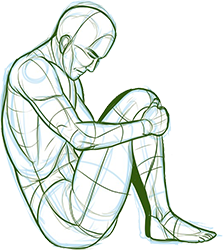 ★ This question about Depression was starred by a moderator on 5/12/2016. Do you often feel stressed and anxious ? I believe these feelings can seem overwhelming at times. I can help you find the tools you need to live a healthier and happier life. A pit , a high energy vortex that keeps pulling you down and down . Its like one of those dreams where we keep falling and falling and there seems no end to it and if this wasnt enough slowly the light appears to dim and before we know it we are surrounded with this dark empty space filled with nothing but our own negativity and suffering and then from the darkness thoughts appear that its better to curl up and die somehow rather than to make futile efforts to climb back up towards the little rays of light that still sometimes penetrate this dark soulless pit . That is how i would describe depression from my personal experience. Depression is a mental illness. It can cause the sufferer to lose interest in the interests and activities they used to enjoy, extinguish any energy or motivation, and cause crippling sadness. I personally have found my depression saps my self-esteem and makes me feel worthless. I also have issues with motivation that leave me even more depressed because I didn't complete tasks. I need to step back and look at my situation as if it was my friend telling me their worries in order to help myself get back on track. Depression isn't a sign of weakness - it's a sign that people have been strong for too long. For me, it's like being invisible. People can see a faint silhouette of you, but they can't see you, they can't hear you. It's like having one eye that sees the past, and the other sees the future, and it all hinges on regret and shame. For whatever reasons a person might have, you objectively see the worthlessness of self-absorbed people, wading about in a shallow pool of things that could never fill the emptiness you experience. Over and over throughout the day, one eye sees into the past, dragging regret and shame to the forefront - "what if it all could have been different; better? What if I could have been better?" But most times the stark reality of your disconnectedness can't be mitigated, fled from, or erased. You are your depression, and it only feeds itself with your self-loathing for it. All the things you've ever done out of sorrow, sadness, melancholy, and loneliness make you hate it, and yourself for being wholly consumed by it. The other eye, another part of you sees what kind of future lies ahead for someone like that, and you generally find the middling of inaction, introspection and internalization the safest place to be. You can't look at people without seeing their own loneliness, but any need to cope with it removed, since they don't even seem to register it's there. It's a wolf, or a predator, a sickness, your natural enemy, and you are it's prey. It's a vast, dark, clouded sky, hiding the moon, and all you want is the sun. It's a stifling of your senses, since they exist on the outside of the prison of your mind, and you exist only in the prison. It's isolation, loneliness, and you exist as a singularity, even among your own "kind". No one can understand the weight, the burden, the constant threat of the flames, or the water engulfing you. They label it, define it, use it, confuse it, but they can't relate. Intellectually you understand others, maybe even glimpse the things that they feel, but can never fully be free, even in at your best or in the best of circumstances. It's the place between spaces, and nowhere at the same time. A gray, washed out, musty air and light, in a cell made specifically and only for you. The thought of release is appealing, but deep down you know it isn't the way out. You're always numb, and always exposed at the same time, like a nerve, over-stimulated by even the simplest of things. Fighting yourself constantly in order to at least appear, if not try to simulate normalcy, you're often exhausted. But the fear that you might have a choice in all that you think, feel, and do is even more terrifying, so you stay, content to let your jailer feast on your deepest desires, your unfulfilled dreams, your insecurities, skeletons and shadows, rather than keep trying in futility to learn what self-worth means on an emotional, spiritual and existential level. It's easier to just keep the facade going that you're nothing but the man in the rowboat, crossing the sea alone. No one understands you, not really or fully. Acceptance is easier, but still a rarity, given what you look like underneath all that you project to everyone else because if they could see your thoughts; if your thoughts and self-image could manifest from your mind, it would be grotesque, horrifying, massive and destructive. All you can do is live with it, and it with you, unless you decide to undertake the daunting, near impossible task of mastering it, mastering yourself. And even then, you haven't defeated anything. There is no ultimate victory to be sung, you haven't vanquished it, only tamed it a little - only given the night sky a few more dim, twinkling stars for you to look up at. I would describe depression as a numbing sadness. The sadness is always behind the scenes of a very blank state of mind. You feel no ambition, no happiness, you aren't interested in anything or care to even get out of bed. You are sort of a walking ghost going through the motions of life. Don't get me wrong; depressed people can have good days, they can laugh and smile and take jokes and have good moments. But the majority of the time when life isn't extremely good the numbness is the main emotion. There is also a lot of guilt in depression. You always feel you do everything wrong, you think people would be better off without you, and you think everything is your fault, etc., etc. For me, depression was like an ache. I knew with time I may be able to drag myself out of it, but it lasted, it stuck around and attached to my like a happiness numbing leach. It was horrible but using tricks taught by a therapist I was able to help others and myself. The best description that I've ever seen with regards to depression is this: "Depression feels like you're drowning.. but you can see all the other people around you breathing"
Depression makes you feel like a shell of your old self. You feel isolated and scared, with no hope of ever being happy again. Life is meaningless; everything is meaningless. You stop caring about the things that matter most; family, friends, and love. When you finally think you can survive these crippling emotions and get on with your life, you are shot back down into the grave you have dug yourself. All you want to do is curl into a ball and hope that everybody will just leave you alone. You feel guilty for bringing everybody else down, but you can't help but lash out at the people pretending that they "get it". You feel that everything in this world is your fault, and you feel that nobody will ever understand. You push everybody away, secretly hoping that somebody will see right through the walls you put up and come and save you. But they never do. Depression for me is like a dark hole, a solitary place of hopelessness, of a profound sadness and loss, and you lose everything, everything seems out of reach and you just are: your just existing. Its a place where you just feel this deep ache, this need for....something....anything to make it better. Depression is something that's different for everyone, I think. It's a very unique experience. For me, it's always been characterized by a lack of feeling. Instead of feeling happiness or sadness or anger, it's a complete apathy. Simply put, I never cared about anything. I didn't care if someone turned down lunch plans, didn't care if it was sunny or rainy. All I ever wanted to do was sit in my room and watch tv. Eventually, it progressed from that apathy towards small things to big things. I found myself not feeling hungry or tired. Eventually, it progressed to the point where I didn't care if my car ran off the road, and that's when I knew this wasn't something I could do on my own. I would describe depression as something that you feel at random times. It just creeps up on you when you're thinking. Many people describe it as drowning or being on a roller coaster that only goes down. But really, I don't feel like that explains HALF of it. It's when you overthink your own problems within your life. It's when your thoughts are very conflicted and you don't know where you stand. It's even when you are triggered... With anything. Self harm, binge eating, etc. It's like a weight as heavy as the world in sitting atop your own chest, and you cannot breathe because of the way you THINK things are. People always say: Stay strong, It will be okay. Yes, this is correct. You will understand that this isn't the way you want things to be, and you'll strive to make your life the best it can be. You'll realize that keeping yourself down or upset, isn't doing anything, except maybe wasting your time feeling sad when you have the ability to pick yourself back up again. Depression is the feeling when you feel like the walls of darkness enveloping you and suffocating you to no bounds. It's like you are trapped in a medium where you can't breathe and you gasp for air and plead for someone to pull you out of this dilemma. It is the worst feeling, one can ever experience as you are drowned in your own sorrow for whatever your personal reasons might be. The feeling that youre heart is slowly bleeding and the brain just doesnt stop producing negative thoughts. The greatest way I ever heard depression described is "Anger Without Enthusiasm" and it resonated with me in a way that I have never forgotten. Depression is a state of low mood, you can feel sad, anxious, empty, hopeless, helpless, worthless and many other feelings. When you are depressed you can lose interest in activities that you loved and did everyday, you can loose appetite or you can start overeating, have problems concentrating, have insomnia or excessive sleeping, fatigue, aches, pains or digestive problems. I think depression is the state of being receptive to negative thoughts. And, while in a depressive state one might absorb enough negativity even to think of committing suicide. Personally, I think it's one of the worst thing that can happen to a person, but sometimes it's unavoidable, but life is not a sprint , it's a marathon. It's like being underwater. It's something heavy and suffocating and you're trying and trying and trying to tread for the surface because that glimmer of light is just there. I would describe depression as the worst thing in the whole world. It feels as if nothing is going to get better. Every day is just the same thing. My description of depression? Its like a giant rock has been put on your entire existence. When you have depression it feels like you have no energy to do anything. It hurts to be happy. For me, depression is like a tiny monster within me that feeds on all of the negative thoughts, feelings, and events in my life. Every negative thought, feeling, and event makes it grow stronger and larger until it has reached maximum size. At this point, it completely consumes me and I'm unable to do anything. I lose all motivation and hope for the future. The best way to defeat the monster is to regain hope. I have to cling to positivity and remind myself of the positive events in my life. Once I have defeated the monster, it goes back to being small and hides within me, waiting to feed on negative thoughts, feelings, and events. It's like being trapped in a your own personal sink hole. Everyone around you is trying to get away leaving you alone. You have no where to turn so you just stand still in shock. As you stand there you sink farther and farther. Eventually you're so deep people begin to see you're not around as much. They see you stuck in this whole and they know they can't get you out. You've pushed everyone so far away and now they can no longer reach you to help get you out. You're more alone than ever and you've done it to yourself. You give up hope because you don't want to go back there just for this to happen again. So you stay put. The only problem is if you don't try anymore you sink farther and the light at the end gets smaller and smaller. You can barely see the light anymore and you don't know what the point is anymore. So you sink even further until that light closes just as yours eyes do. Never to be opened again. Your personal sink hole was your personal grave. Depression is a cruel punishment. People can get through anything as long as they see the light at the end of the tunnel. But when depressed, you see no light. Depression is a disease. So,there is a big difference between depression and sadness . Are completely different situations . Being sad is natural to humans , it is something that happens due to the fact that we are beings with emotions . 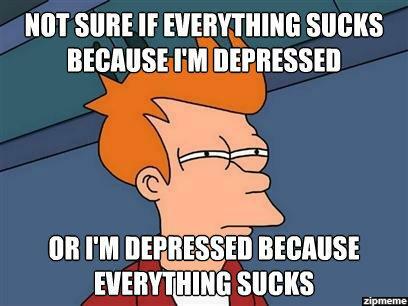 But , having a depression , encompasses not only be sad , but other things . Our immune system is affected. People with depression sleeps too little or too much, eat too much or do not feel in the mood to eat . Cry for everything or nothing . Think of death several times a day . Feel a different pain of grief. Can not produce certain important things in your body . The health diminishes , indeed , depression is a mental illness . When you feel with some of these symptoms , please head over to a doctor . Being depressed can destroy your life. Take care of yourself. Slipping into depression feels like falling down a dark bottomless shaft, wondering if and when your fall will ever be caught. And as you look back to where you fell from--which is where you know you need to get back to--you can see it receding further into the distance, the proverbial light becoming dimmer and dimmer, while the shaft into which you are falling becomes deeper, darker, and all the more enveloping. I would describe depression as a tidal wave. For me, from my own experience, I felt like I was drowning in negative emotions and thoughts. I found it difficult to breathe and at times wanted to stop trying to pull myself to the surface. Though with professional help, I found it easier to push myself to the surface and when I finally did - I could breathe again and start putting myself back together. Depression is a serious mental illness and should not be dismissed. I think everyone has their own version of depression. We're taught to notice the signs: feelings of helplessness and hopelessness, loss of interest in daily activities, appetite or weight changes, sleep changes, anger or irritability, loss of energy, self-loathing, reckless behavior, etc. but not everyone experiences those things. I was diagnosed with clinical depression not too long ago; I don't know how exactly to describe it, but for me it's sort of this overwhelming feeling of inadequacy. Depression for me manifested itself in different stages; mild, moderate and severe. Mild is the constant dull headache, dampening my emotions but more bearable when distracted. Moderate was the soundless weeping, energy sucking leech. It gave me bastardized emotions back, and misplaced them to the extreme. Intrusive, self-distructive and sometimes suicidal thoughts were present during this time. Severe depression took my emotions away. At first it seemed like a relief, a freedom to be free from the emotions that plagued me so much on the journey here. I even thought faking emotions to keep interacting with the world would be enough (hint - it wasn't). The apathy became a double-edged sword, saving me from the pain but damning me from any joy. When you get past the apathy then you struggle on at intellectual level of frustration at your inability to just FEEL like other people can, to have what they have. After a while it had been so long I would even crave the anger, the sadness and the pain over joy or love or humour. Bargaining just to have a glimpse of something over the desert that was once my emotional plane of existence. This was at my darkest time with depression. Depression is a constant feeling of sadness that can make a completely normal day turn into one of the worst days you've had. Related Questions: How would you describe depression?